Hearing aids behind the ear offer a range of different benefits. Once upon a time, the only type of hearing aid available was a large model that took up most of your ear. Today, there are many different styles, including hearing aids behind the ear. A hearing aid behind the ear offers a number of advantages to the older style, including providing better sound amplification, and also being far less visible. BTE style hearing aids (behind the ear) can be used by just about anyone with any level of hearing loss. You’ll find two primary styles here – one uses a thin tube, while the other hooks over the ear to stay in place. Another style is RITE, or receiver in the ear. 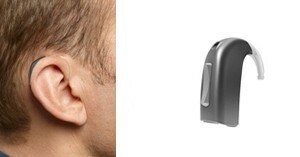 The large module fits behind the ear, but the receiver itself sits in the ear. A miniRITE hearing aid offers the same benefits as a RITE model, but provides a smaller module behind the ear. This is less visible, and the attaching tube cannot be seen, either. A final type of hearing aid behind the ear is the CROS/BICROS system. These are used for people who are losing their hearing in one ear. The module itself sits on the good ear, and a microphone is routed to the ear with hearing loss. Most hearing aids that fit behind the ear are designed for use by those with mild, moderate or severe hearing loss, but you’ll need to have a personal evaluation. Contact us at Pindrop by calling 416-484-4327 to learn more about our hearing aids and to set up a personal evaluation of your hearing loss.